fargo, the city I know so well. the city of dreams… dreams of summertime in the midst of long winters, that is. dreams of mountains and oceans, dreams of air that doesn’t hurt to breathe. the weather’s getting a little warmer around here and people are stripping off their winter parkas, feeling slightly uncomfortable in their relative nakedness. my new little apartment is just my size. it feels a bit naked as well, with its lack of furniture and other people. i like to think of the emptiness in terms of extra room for yoga and late night (or early morning) solo dance sessions. my cat makes it feel like home though, and i am eternally grateful for her incredible listening skills. my new job also has cats, and one of them sits on my lap sometimes. i can look out big windows at trees and my coworkers are beautiful and there is a limitless supply of coffee so i’m quite happy there. i’ve now finished a class to become tefl certified (teaching english as a foreign language) so as soon as i turn my final papers in, i will be qualified to teach english overseas, which i hope to do next year. today I was daydreaming a bit…remembering my first day in belgium on my most recent trip. being so tired and out of it, it didn’t register how ridiculous it all was. want to hear a story? I was up late in dublin with my couchsurfing hosts and several of their friends. we went out to a bar and had a few hot ciders and mulled wines and laughed and I listened to their beautiful french speech and talked to a new spanish friend about writing and cats. 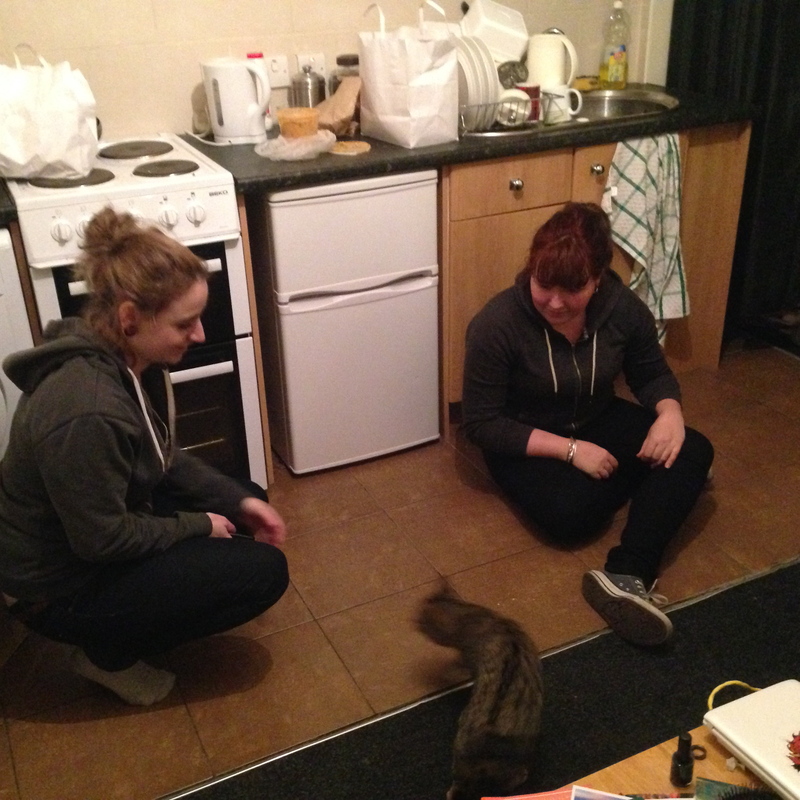 as we walked home that night, my two lovely couchsurfing host ladies and I found a stray cat wandering the streets of dublin. we spent about an hour earning its trust and eventually coaxed the poor lost kitty back to the apartment with us. three hours later, i was in a cab on my way to the dublin airport. the sun shone through the windows brightly during my descent to brussels, and needless to say I was exhausted and totally unprepared to enter a new country. but, i entered a new country….right into a total public transportation strike. now, if you know me, you know I travel on a budget. I did not have a taxi budget, and although there was room in my funds for emergencies, a taxi into brussels city center would have costed me about €50…that’s something like $75. when your budget is 50 USD per day, you fret about that kind of cab fare. “are you headed to the city center?” he asked. i nodded again. “want to share a cab?” he asked. now, before i left home, i made no promises to anyone except one: the promise to my father to not share a cab with anyone. too many sequels of “taken” had come out for him to not give me this sound advice. so, dad, this is a disclaimer for you: please forgive me. but know that my intuition is strong and my general rule in life is TRUST NO ONE. so, i followed this man to the taxi line, where we were going to pay our €25ish each to get to the city center. he suggested we try to catch an uber taxi instead. i seemed to be doing a lot of shrugging and nodding that day, and this i did again as we climbed over the fence together and headed upstairs. we wandered around trying to find the one that showed up on his phone, finally found it, and met the man who would be our taxi driver. the taxi driver only spoke french, and in this moment i had to turn on my body language reading skills to understand their conversation and see if this was still a wise decision or not. i could tell the driver’s french was broken, and the two men did not know each other. being unfamiliar with uber prior to this, i wasn’t expecting an unmarked minivan…but i noticed the driver’s uber keychain as well as his kind and gentle demeanor. i sensed that he was new to belgium and that he had young children. i could sense his fatherliness and compassion for humanity in general. i laughed and told him his english sounded good, and he let go of a little fear. he told me how he had always wanted to visit the united states, because he had family in california. he told me about his children and about how he drove the uber taxi as a second job because he wanted his wife and children to have nice things. he thanked me for letting him practice his english and proceeded to drop me off at my hostel, where he told me my first uber ride was free and gave me coupons for more free uber rides. thanks for the help, God. collapsing onto my hostel bed, i thought i was going to avoid any socialization and instead sleep for a whole day and a half. that was before i met my sole hostel-mate. she entered the room smelling like vodka and carried an air of the belief that she used to be lovely when she was young. she ignored me at first. an hour or two later, we began a conversation that would last deep into the night. “there is still hope for you,” i said. “that’s what i believed when i was your age,” she replied. we cried together that night–two women whose souls hurt for very different reasons, two women brought together and connected by humanity. two women who would then go to sleep, and wake up to say a short goodbye and never see each other again. was my first day in belgium.